Fall, my favorite season is approaching and we are leaving summer behind. 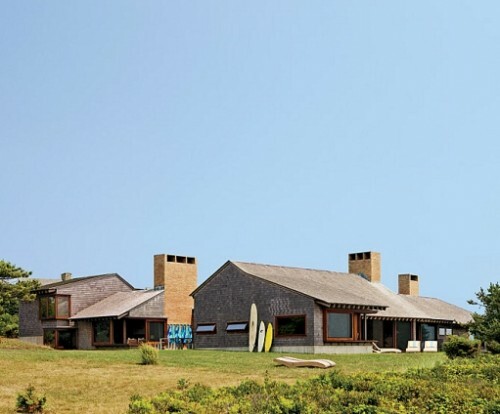 Today, a little Shelton, Mindel & Associates Martha’s Vineyard inspiration. Summer, we love you. A pedigree of modern pieces; Arne Vodder chaise, Jean Royère armchairs, a Pierre Chapo low table and a Franco Albini rattan armchair. I love the fully enveloped cedar wood room with the exposed brick fireplace. Warm and welcoming. What could be better than a bright orange Saarinen Tulip table? 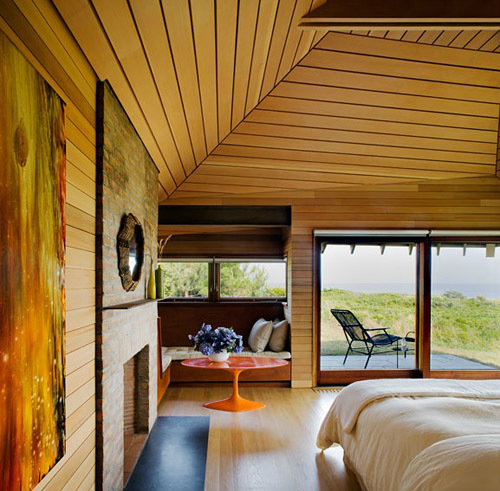 The textures of the cedar wood ceiling and wall cladding paired with the brick, bluestone hearth and the woven shades is quiet and cocoon-like. 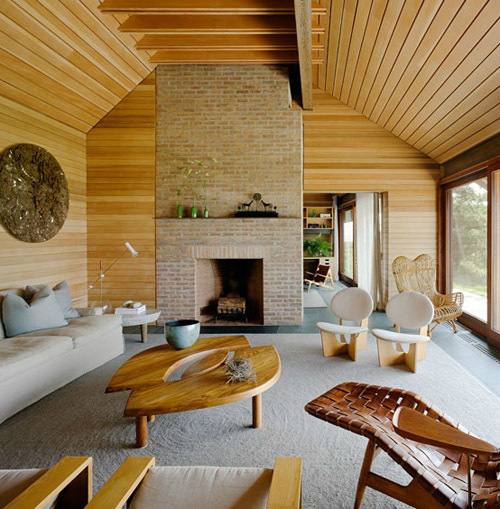 Ruelland vases, and Jean Prouvé chaise. 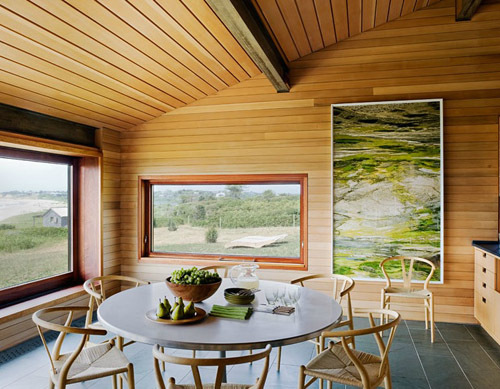 Cedar wood walls and ceiling and Hans Wegner Wishbone chairs and a Fabricius & Kastholm table. Amazing photograph by Noriko Furunishi. A casual kitchen with cedar cabinetry and bluestone countertops. Accessorized with Michelle Boyer candelabrum and green vases by Dani and Jacques Ruelland. 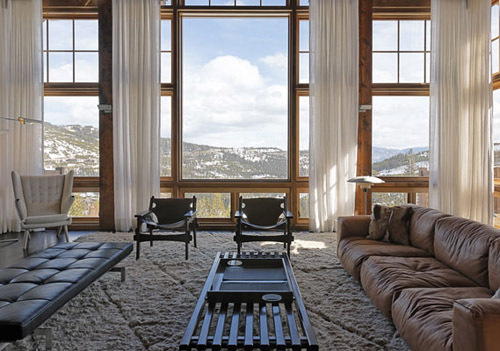 I am headed to Montana today…so here is a little modern Montana inspiration. How can you go wrong with a Poul Kjaerholm PK80 daybed, and Kilin chairs by Sergio Rodrigues? This Zanotta sofa is one of my favs. Perfectly edited and curated interior. 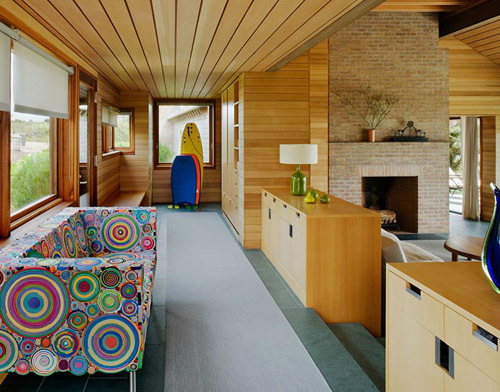 Do you notice the rug…it looks like the ripples in a pond. These windows!! Jeff Zimmerman objects. Light and relaxed color palate. Pierre Chapo vintage coffee table. I love this flat owned by Parisian gallery director Didier Krzentowski featured in Dwell, June 2004. There are unique vintage artful finds in every nook and cranny. Murano glass vases by Jerszy Seymour. Marc Newson Orgone stretch lounge. This Gino Sarfatti 2109/16 ceiling lamp is A-mazing! Marc Newson Embryo chair dates from 1988. I love it paired with this blue rug. This bright pink Smarties table by Mattia Bonetti is so fun and unexpected. Wow, vintage everywhere! I am not sure if Ron Arad’s Rolling Volume chair (in black) would be comfortable to sit in, but it does look cool!